An Update on My Work Life! Hey there! Today I wanted to give a little update on my work situation. If we’re friends on Instagram (@kristinarunning) and you watch my Stories then you probably have noticed that I’m at home a lot during the day. That’s because I’m now a stay-at-home-cat-mom. JUST KIDDING :). In September of last year, after working for the same company for five years, I changed jobs. Unfortunately I ended up loathing my new job, and in October I put in my two weeks notice. I didn’t have a concrete backup plan at the time, but I knew I had no future at the new company. Every night I would come home and tell Adam what my job was like and he would urge me to quit immediately. I am grateful that we are in a position where that was a possibility so I quit after only a month. Luckily things worked out for me right away and I’m happier with my career now than I’ve ever been. With my new situation comes the ability to work from home which makes me SO happy. Cecil is now my full time assistant manager. He keeps an eye on me all day (except for when he has to take his nap breaks) and makes sure I’m getting all my work done. Three thousand hours equals 125 days. Over the course of five years I wasted the equivalent of 125 days sitting in traffic. Ouch. There are all kinds of studies being done about how commuting is bad for our physical and mental health, so getting myself out of that situation was important. The only downside to this new arrangement is that Cecil sometimes decides he needs attention when I’m in the middle of something important. 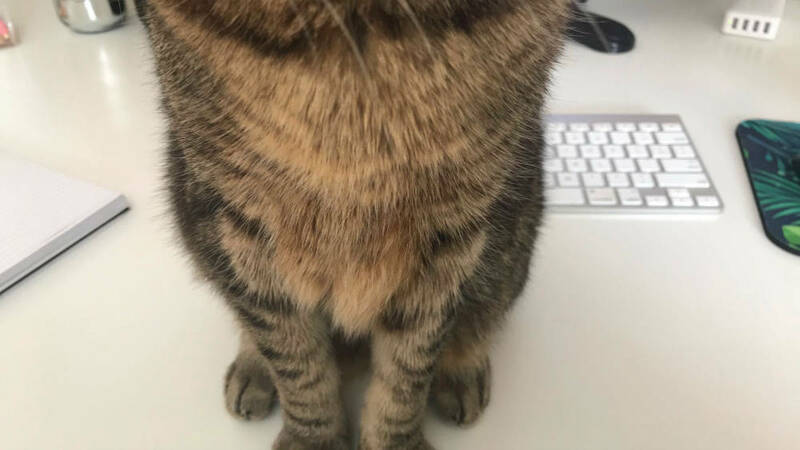 When he wants attention he demands it by sitting down on my keyboard. He gives zero F’s and will get a head rub when he wants it :). I tell him he has to move, but I don’t think there’s any conviction in my voice. Another benefit of working from home is that I can use my lunch hour to do any number of things. Usually I use it to eat lunch like you would expect, but yesterday I dipped out to Sephora to pick up a new bottle of moisturizer because I ran out the other day. Before I would have had to wait for the weekend to hit the mall because I would be too tired or it would be too late, especially on the nights that I would need to go running. Speaking of which being able to go running early in the evening instead of starting my run at 7:15 or 7:30pm is going to be a game changer. I used to make dinner at like 9:30pm which is too late to be eating if you go to bed at 10 or 11pm. Now I’ll be able to go running and still make and eat dinner at a decent hour. Literally my whole life is changing and I am a new person, haha! Adam also works from home two days a week so the whole fam is together on those days. Except he works downstairs and my office is upstairs so we don’t really see each other except for lunch time. It is nice that we can have lunch together on those days though! So the point of this post was just to update you guys on my work situation because the most common DM I get is the polite version of, “don’t you have a job anymore?” And the answer is yes, I’m just doing the work from home thing this year :). It’s not all cats and coffee, I do still spend most of the day managing marketing and advertising campaigns. 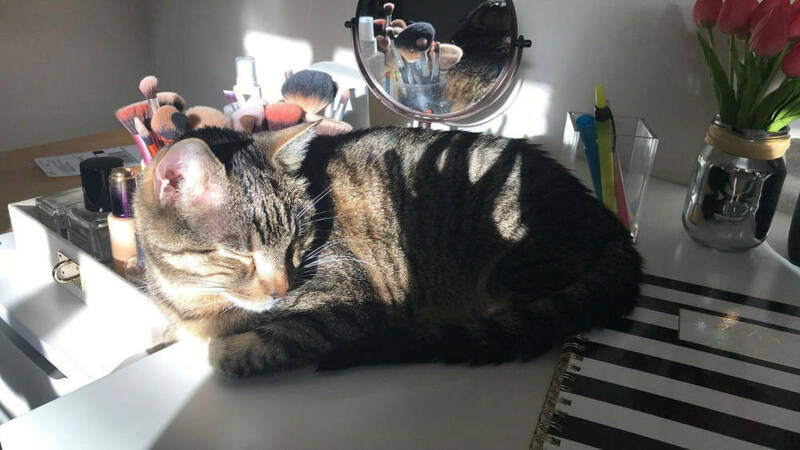 I have to work hard to give my cat the life he deserves! Are you able to work from home some days/all the time at your job? How long is your commute into work? Do you ever get errands/shopping done during your lunch break? Previous Post I FINALLY DID IT!!!!!! 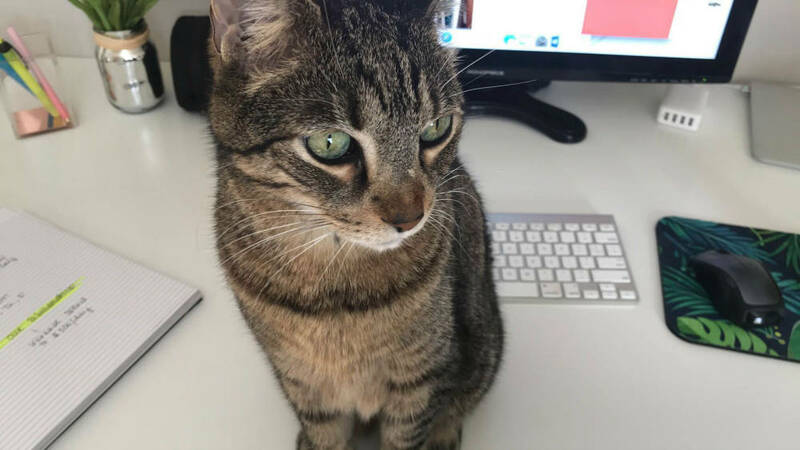 I’m glad you are loving the work from home situation! I always felt so bad for you and all the traffic you had to sit in. 🙁 What a freaking game changer. Thanks Megan! After a while it really took a toll on my daily outlook on LIFE! Being able to work from home has made me not hate what I do for a living anymore so that’s nice :). That sounds like a really great improvement for you. I would hate to sit in a 2.5 hour commute every day. I have a 30 minute one, which isn’t too bad. I just use that time to listen to NPR and catch up on current events. I do wish I could work from home sometimes. I work at a physical therapy clinic as an Exercise Specialist, and since patient care is the main objective of my job, I don’t really have the opportunity to work from home. 30 minutes isn’t terrible! As you know, it takes about 30 minutes to get from just about any point A to any other point B in south florida so that amount of time in the car wouldn’t bother me too much! That job sounds perfect for you! You have the right personality for it and a passion for it too! Oh wow that commute is GNARLY! I’m so glad you don’t have to deal with that. So are you working from home 100% or do you occasionally go into the office? I wish I could work from home more often. Even though my job is almost all digital so I technically could, it’s just not feasible a lot of times for a variety of reasons – I man our general phone line for the time being, and I also deal with a lot of confidential and sensitive donor data, including handling monetary donations. That said, I live 5 miles from work and have a quick, easy commute so I don’t have much room to complain. It could be a lot worse. As someone who often has trouble leaving the couch, it’s probably good for me that I’m forced to get out in the world every day :-). I’m glad that working from home is becoming more common and that so many more people have that option now. Starting in a couple weeks I’ll be working from home every single day, the countdown is on and I am very excited for it! Being five minutes from the office sounds perfect. You get out of the house and are able to interact face-to-face with other people but you still get home fast enough to enjoy your evening. Working from home definitely feeds into my anti-social tendencies and that’s maybe a little concerning. I hope it doesn’t get to the point that the only people I interact with face-to-face are Adam, Cecil and the Postmates delivery guy! I commute about 75 minutes one way by a combination of car/foot/train but I really don’t mind it. My train ride is the perfect amount of time for an episode of Parenthood or Mad Men, or I can zone out if I need to. I work in Boston but live in the ‘burbs so the commute is totally worth it to me to have the best of both worlds! 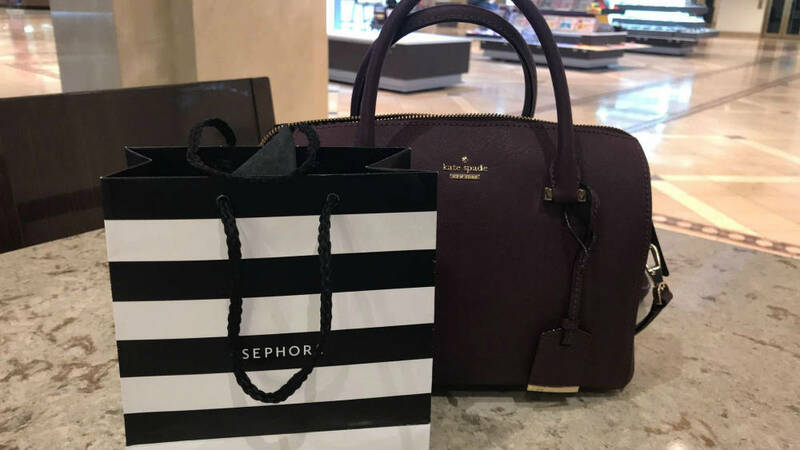 So yes, I can do shopping at lunch… in fact my office building is in the middle of a shopping mall so I wouldn’t even have to go outside if I wanted to go to Sephora! WOW I seriously commend you for finding the positives in a commute that long! I think I could handle a long-ish commute if someone else was doing the driving part of the way. What killed me the most about my commute is that realistically the drive should have taken me about 25 minutes but instead it took me over an hour each way because I had to sit in backed up traffic where we would inch forward at a snail’s pace. That kind of traffic is just mind-numbing to be in. That’s so convenient that your office building is inside of a mall :)! That was a long commute. Ugh! Now I feel bad when I complain about my 7 min trip to work turning into 10 mins when I get behind a school bus! 🙂 But that’s what I get when I don’t leave until 5 mins before I’m supposed to be at work. My bad! I am adjusting quite well to my new work schedule – although I was a bit nervous about the pay cut due to less hours. I got through the first month, so far so good! The part of my job that I work at home for is really great. Wish I would have done it YEARS ago. I don’t mind the drama at my office one bit. Makes my day so much less stressful! Very exciting about your job! Did you end up going back to your former employer and they worked out a better situation for you, or did you find another opportunity? I’m so glad to hear that everything is working out for you with the new job situation and you have more time to spend with your family. I am working with my former employer, we got the band back together, but I’m also doing a little consulting as well. It’s a good mix and keeps my day exciting! I am so incredibly happy for you!! Working from home is my DREAM come true!! I’m currently having to drive 1 hour and 30 minutes from home to work in the mornings, and then 1 hour an 20 min all the way back. That’s almost 3 hours sitting in traffic. And dinner is another issue I suffer with. I wish we could have dinner before 7pm but it’s basically impossible. Thanks girl, I hope you get to work from home at some point too. Honestly traffic down here is so bad more employers need to consider WFH as a benefit to keep good employees! Are you working for a company or freelancing now? I love working from home. My commute is only 25 minutes and it’s a nice drive but I work from home 2-3 days per week and love it. WFH is the best! 🙂 I got back together with my former employer but I’m also doing some consulting too. It’s a nice mix that keeps me busy and keeps things interesting! Being able to work from home is truly a blessing. Glad I did the switch too. And Cecil looks absolutely adorable! have finally decided to write to you after reading this article! I am currently studying the PhD Physical Therapy program as well as write on my own blog (although just started hehe). I also have a bachelors degree in Kinesiology and I am a Certified Strength and Conditioning Specialist. Your writing is really inspiring! Just checked in to tell you. Finally stepped out of the shadows of just being an anonymous reader!